Blog - Beautiful Pre-1921 Certified Morgan Dollars at the Lowest Prices Online! Morgan Silver Dollars are arguably America’s most popular coin. Of that group, those minted between 1878-1904, or what we in the industry call 'Pre-21 Morgans' are the most popular. Numismatists adore “Morgans” for their impressive size, significant silver content, beautiful design, and historical allure. In particular, Choice Uncirculated pieces are in constant demand. Coins in MS63 and MS64 are well-preserved yet remain extremely affordable. 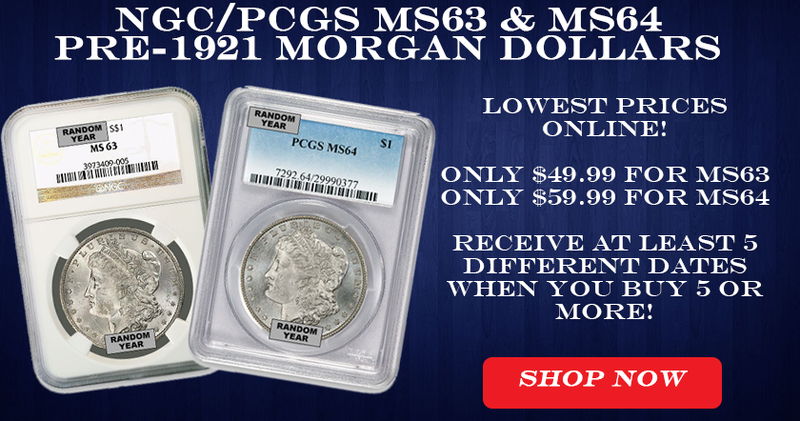 For well under $100, these Mint State Morgans represent outstanding value. This is especially the case now. Within the past decade, we can remember when MS63 and MS64 Pre-21 Morgans were trading wholesale for $75 and $125 respectively. More recently, these coins have settled to the most reasonable levels we’ve seen in many years. 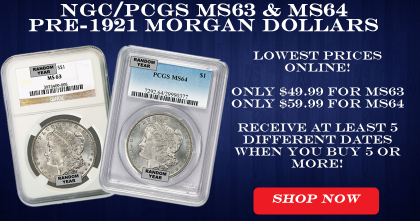 Today, you can own PCGS/NGC MS63 Morgans for just $49.99 per coin and PCGS/NGC MS64 Morgans at $59.99 each. These coins are all white, untoned and in clean holders. We personally selected them for quality; you’ll be impressed how they look compare to most dealers’ coins. In addition to giving you a wholesale price, we’re sweetening the deal even more. Buy 5 or more coins and we’ll deliver 5 different dates! This is a great way to build and instant mini-collection. To recap, you now have the opportunity to buy high-quality Morgan Dollars at a wholesale price with an excellent variety of dates. If you’ve been looking to add Morgans to your collection or portfolio, this is the best way to do it!